How can you take such an interesting, exciting and complicated world with so many conflict possibilities and write such a crap book about it? It’s rather amazing. 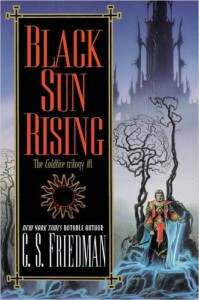 I haven’t read a proper fantasy novel since my early high school days. Back then I used to chain-read Andre Norton but I can tell you very little about as it has been mostly eradicated from my memory to make room for all the plotlines of Grey’s Anatomy. Therefore I can’t tell you if C.S Friedman writes badly or whether she is in line with other fantasy writers and what is considered the norm in the genre. This is not a very sophisticated way to introduce characters (very minor ones as well), almost as bad as having the characters look in the mirror to describe their looks. So there is this sort of lazy writing and there are characters who say every other page ‘God help us’ or ‘gods help us’, depending on which denomination they belong to. But that’s nothing, it could still be a four star read because the world, in which the nature produces currents which respond to psychic stimulus and can take a physical form, is a fascinating and intricate one. There is an outline of a religious conflict between the old religion (based possibly on Christianity brought to the planet by its colonisers from Earth) which rejects any use of those magic-like currents and all the new religions invented on the planet which pretty much base themselves on the fae – the currents. But instead of this fascinating story of high politics, religion and magic, we have a lame tale of a girl, Chiani, who lost her special powers and a group of men who, for god (or gods) know what reason decide to help her get them back, even if it means risking their lives. We have the priest who has a bit of a crush on Chiani, which is why he decides to ruin his career and go against everything he believes in just to help her, while still acting like a self-righteous prick when he is forced to accept help from someone who seems to be not a very good person at all (we will call him the Lesser Evil). The Lesser Evil puts up with the self-righteousness of the Self-Righteous prick and generally acts in a very honourable way and is the most interesting and three-dimensional character, which is quite funny because he is supposed to have no human soul left in him. I don’t know how Friedman managed to make her inhuman character the most human of them all but it probably wasn’t intentional. Oh, and there is this one more character, so superfluous that you can’t help but wonder if he is going to be killed off somewhere along the way. The four of them set off to get Chiani her magicks back. Chiani’s motivation is obvious but the rest of them follow because of some peculiar mix of honour debt, loyalty, and simply having hots for her. The fact that they are actually saving the world (and therefore themselves) at the same time seems to constantly escape them, when focusing on that would just make a lot more sense and make their motives logical. In the end it’s a fairly enjoyable read but you are left thinking that there is a better story happening somewhere else in that world.